We are releasing the results over the next few days, grouping some items together for ease of presentation. 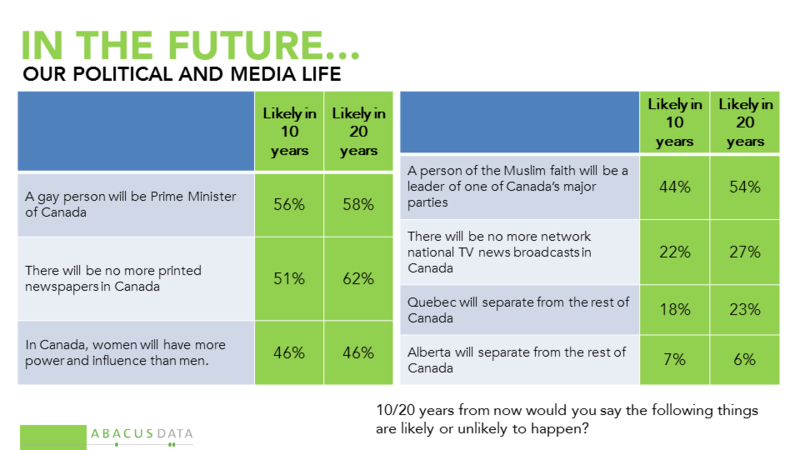 • The majority (56%) think it’s likely that Canada will have a gay Prime Minister within the next ten years. Almost as many (44%) say its likely that a Muslim will lead one of our major political parties. • Half (51%) think there will be no more printed newspapers and 22% think there will be no more national news broadcasts on TV. • 7% think Alberta will separate from Canada (11% in Alberta), and 18% think Quebec will separate (20% among Quebecers). • 46% believe that women will have more power and influence than men in Canada, slightly higher among men (49%) than among women (44%). • Liberals are more likey to believe women will have more influence than men. • 62% of Liberals foresee no printed newspapers, compared to 51% among Conservatives. 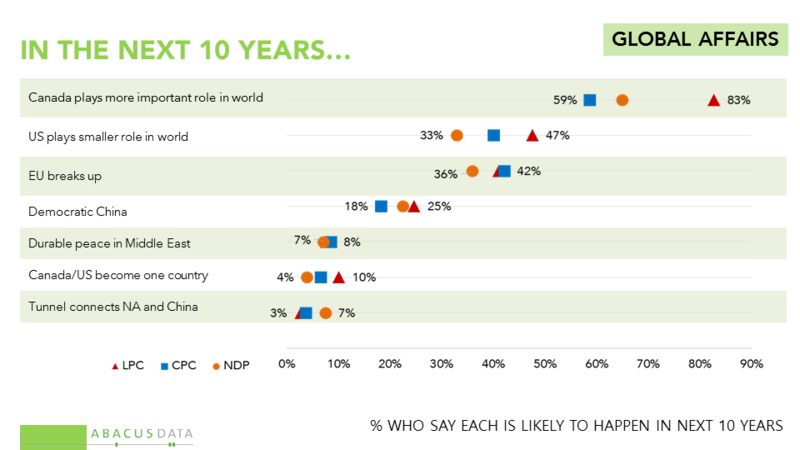 • Two out of three (66%) think Canada will play a more important role in the world. • 42% think the US will play a smaller role in the world. • 41% think the EU will break up. • 23% think China will be a democracy. • 11% expect there will be a durable peace in the Middle East. • 9% think Canada and the US will be one country. • 7% think a tunnel will connect North America and China. • Liberals are most likely (83%) to say Canada will play a more important role, but majorities of each parties’ supporters feel this way. • There were fewer differences across party lines on the other questions. 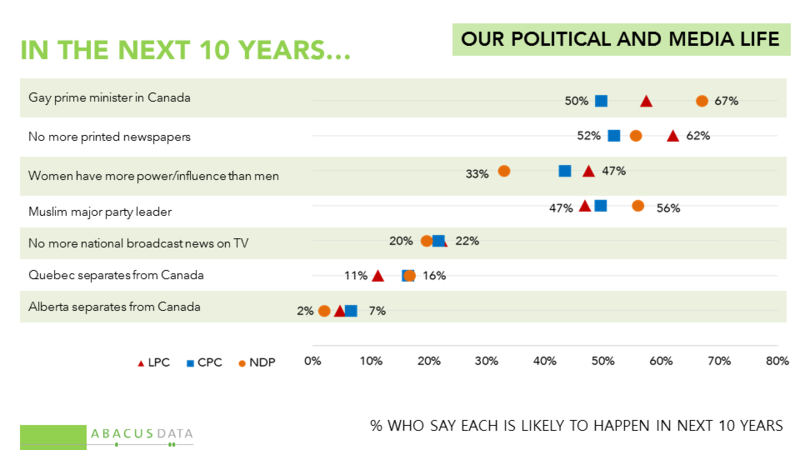 • 62% thought it was likely that there would be no printed news papers in Canada in 20 years compared to 51% in a 10 year period. 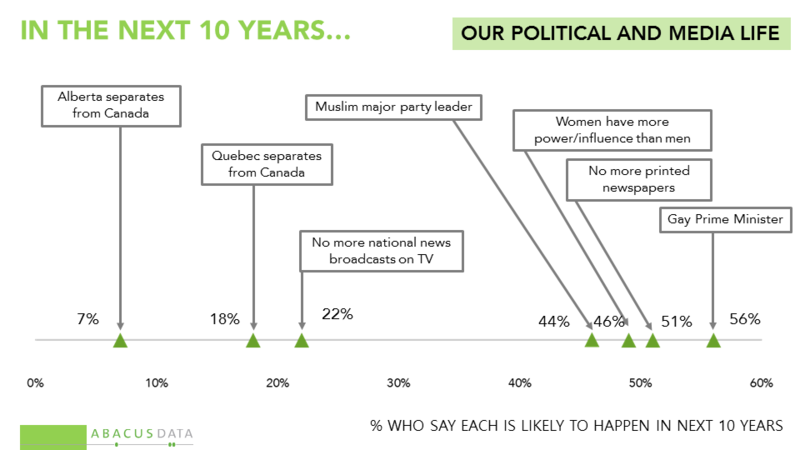 • 54% thought there would be a Muslim major party leader in 20 years compared to 44% who said that would happen in 10. 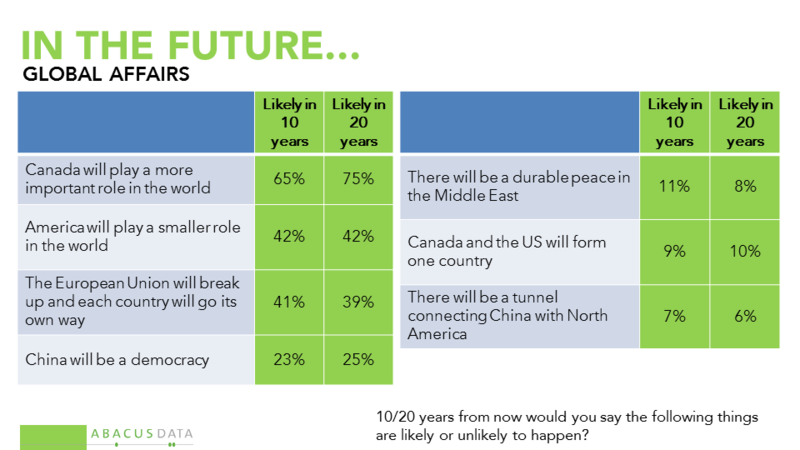 • 75% believed Canada will play a more important role in the world 20 years from now, 65% felt the same in 10 years. Bruce Anderson: “The numbers tend to speak to an optimism about the country and a comfort with our values. We don’t expect our country to break up, or merge with the US, and we do expect it will have more influence in the world. 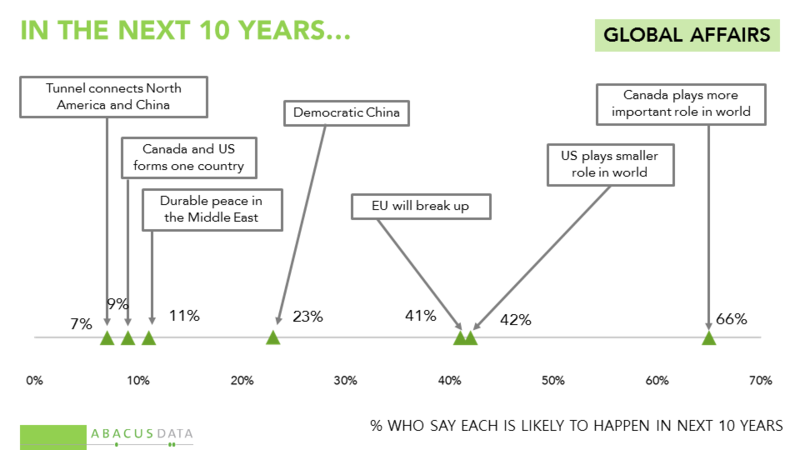 There is uncertainty about the course of global geopolitics, including the future of China, the US, and the EU, but pessimism about peace in the Middle East. Our next release will explore our expectations about health, life, and technology.